The rear façade is as attractive as the front exterior and looks every bit like it is the front of the house. FAIRFIELD — Cosmopolitan as downtown Fairfield is — with its mix of upscale and casual eateries, boutiques and Fairfield Theatre Company — it still has many rural properties. Most people would assume those properties are located in the northern reaches of the town near the borders of neighboring Weston and Easton. They might be surprised to learn of an equestrian estate in lower Greenfield Hill not far from “civilization.” The custom-designed and built colonial farmhouse at 194 Ingleside Road is beautifully positioned on a level property of 5.51 pastoral acres, only about a mile from the Fairfield County Hunt Club in Westport and only minutes from the Post Road (Route 1) shopping and restaurants in Fairfield and Westport. It’s a rare opportunity to purchase something unique on the market, especially for those engaged in horseback riding or dressage for pleasure or competition. They can engage in their equestrian pursuits while also living an easy commutable distance from local conveniences, including the train station and major motor vehicle arteries. 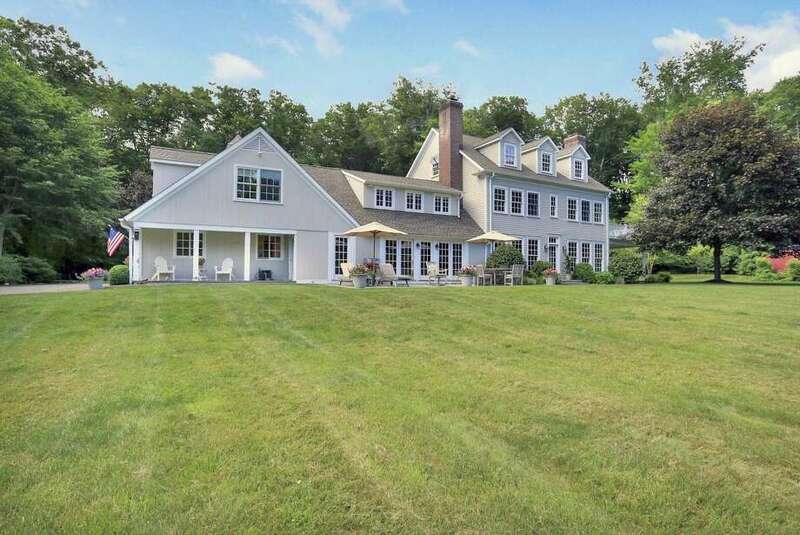 Despite the acreage and square footage of this house, taxes are comparatively low because the property falls under Connecticut Public Act 490 governing agricultural and open space. A recent unique marketing event put a spotlight on this particular lifestyle. Realtors from several agencies joined forces to hold an open house on the same day at their respective properties within proximity of the Hunt Club. The event, called Brokers, Bites & Bits, included an invitation for Realtors to visit the club and familiarize themselves with its features and services for prospective homebuyers. According to the Hunt Club’s website, it offers “resort like amenities, gourmet dining, first-class sports programs, exclusive events, and vibrant social scene, bustling with family friendly activities” at “Connecticut’s premier equestrian country club.” The Realtors said it introduced prospective buyers not only to houses but to the club and the local community. Additionally, the very private Ingelside property abuts an Aspetuck Land Trust open space property and has immediate access to miles of the Fairfield bridle trails. No need to trailer horses elsewhere to ride. This property was originally owned by the Pepperidge Farm family, and this 4,489-square-foot modern-day custom farmhouse was built on a portion of that farm in 2012. In addition to the house, there are several paddocks and a two-stall red horse barn with water, electricity, and a hay loft. The house is not visible from the street. It requires traveling down a very long, partially shared private lane to access the sizable parking areas and the house. Although no one can see this house but the occupants and their guests, the structure was designed in an unusual way. The rear facade is as attractive as the front exterior and looks every bit like it is the front of the house. The front door opens to the two-story foyer. Inside, there are 13 spacious rooms, an open-concept floor plan, custom millwork, oversized windows, numerous doors to the outside, 9-foot ceilings, and two fireplaces. There is a third fireplace outside. The formal living room features a stone fireplace with a raised hearth flanked by multipaned doors to a covered slate patio, which has the exterior red brick fireplace. The formal dining room has a door to the backyard and two entrances into the family room, which has a fireplace, a wall of floor-to-ceiling windows and a door to an open slate patio. There is another covered patio by the attached two-car garage. The office features a built-in desk and coffered ceiling. In the gourmet kitchen, the features include a 10-foot-long white pearl granite island with a breakfast bar for five, large pantry, and a six-burner Wolf gas range with griddle and double ovens. Off the kitchen there is a large mudroom with a built-in bench and cubbies, powder room and laundry room. This house has five bedrooms. The master suite has a door to a private balcony, an oversized walk-in closet with organizers, and a luxurious marble bath. In addition to bedrooms, there is a sitting area and reading nook with built-in bookshelves and a window seat. On the third floor there is a large multipurpose bonus room. For information or to set up an appointment to see the house, contact Kelly Finn of Houlihan Lawrence at 203-895-0961 or kfinn@houlihanlawrence.com.